After hearing about The Sleep Doctor’s Sleep Slim Smoothie on the Dr. Oz Show, I decided to give this smoothie recipe a try. With a toddler an a 6 month old, I get pretty worn down, and I so I was definitely game for trying just about anything that would help me get more out of the few hours of sleep I can get. And if this Sleep Slim Smoothie would help me burn some extra calories while sleeping, well then YAY! So I whipped up a batch for my husband and I. He wasn’t a fan, but I thought it was pretty good. A little tart, but overall, the taste was pretty good. The man behind this Sleep Slim Smoothie Recipe, Dr Michael Breus, PhD, The Sleep Doctor, claims that cherries are one of the richest known sources of melatonin, the sleep hormone that recent studies have shown can also help reverse the effects of aging, while bananas contain loads of magnesium, a calming mineral. And that soy milk is high in tryptophan, the sleep-inducing amino acid. Sounds good to me. But OK, I know what you are thinking…6 Points for a smoothie? Yes, I know it’s a lot of Points to sacrifice on a a drink, BUT, I have to admit that after just one of these smoothies, I really did feel like I slept better and had more energy later. I didn’t even need my 3:00pm cup of coffee, which says A LOT. As for whether or not I burned more calories while I slept, I don’t know, but if you enjoy this smoothie recipe and have the Points to spare, it’s worth a shot. 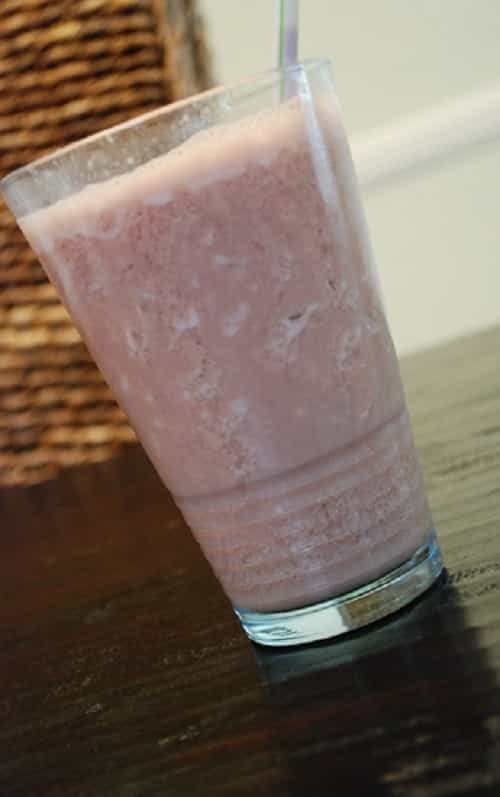 I’ll continue to fit this Sleep Slim Smoothie into my meal plan on an occasional basis and see if I continue to at least notice enhanced sleeping! This Sleep Slim Smoothie, as seen on the Dr. Oz Show, claims to help burn fat while helping to enhance your sleep. Tasty and nutritious, this smoothie recipe boasts just Points per serving. I was recently diagnosed with bursitis and my pastor told me of this concoction. Its supposed to aid in relief of joint pain. When I googled it, its also for weight loss. Has anyone gotten results for one or the other? Soy isn’t good for you. I also am on weight watchers and came up with 3 points using points +. I think you miscalculated. Any update to this? Are you still drinking it? I am curious. Thanks! Skim milk contains the same amount of tryptophan as soy. I have a thyroid issue and will not touch soy, so it’s fine to replace with milk! Also, you could just eat a banana and have a “shot” of the tart cherry juice for the same effect, count the 4oz as a point or 2. Your body is not going to process much trytophan out of a 1/2 cup of milk anyway. The melatonin comes from the concentration of the juice. Real cherries do not have the same effect but are still wonderful for you! MJ, Curious as to your statement about why you won’t you eat soy with your thyroid issue? I would love to hear more about this, as I’m vegetarian and both my endocrinologist and registered dietician brushed off my concerns regaring soy and thyroid issues. Also, loved the recipe for this smoothie! Thank you! I bought a Tart Cherry Juice Concentrate from Kroger’s organic all natural section. Pricy, 17.00, but makes 2 gallons (the premade stuff was 6.00 for a quart). The PPs value is 2 (I think). Can NOT wait. Are you referencing weight watcher points? I am currently on WW and when i calculated the points I came up with 3 points. Yes, I’m talking about Weight Watchers Points Plus. I think the Points Plus value will depend on the brand of specific ingredients used. My cherry juice was a bit high in carbs…and I used a reduced fat soy milk instead of fat free. I too was also going to ask what time of day you tried this. I like the sound of this, but am not sure when I would fit it in being that many points. I typically only have 3-4 points for breakfast and lunch. I skimp all day and snack on 0 point stuff in order to be able to have our regular family dinner. I’d recommend drinking it at night, after dinner. I drank mine around 9:00am, knowing I was going to be taking an afternoon nap around 1pm. My question too is “what time of day do you drink this?” Also, like the idea of real cherries as opposed to the juice. Also, do you find tart cherry juice in the juice aisle? As for the tart cherry juice, yes, just check your juice aisle. I got mine at Trader Joe’s. I wonder if you could use actual cherries instead of cherry juice. Then the points would be much lower. Do you drink this anytime of day or at night? Can you substitute skim milk instead of having soy? I’m actually allergic to soy milk. Maybe unsweetened almond milk. I’ve been using it for my oatmeal in the mornings. Taste good too. Prefer it to soymilk actually. I actually prefer almond milk too, but the soymilk is essential for this recipe because the soy is an important factor in the smoothie’s ability to “slim” and improve sleep.